Need Parts? Email order form to rbheying@midlands.net or send an email stating the parts you need. Or, call to discuss the repairs you need to make. If you choose not to use the order form then please provide accurate and complete info for us to be able to ship you parts. What info do we need? When placing a parts order we will need to know: 1) Name of Organization or Person who owns the machine (a serial number off the machine also helps). 2) Address for Person or Organization to ship to? 3) Is the ship to address a business or residence? 4) Who's Attn. to ship to? 5) Cell Phone and Email for person we are shipping to. Please don't ask for a "quote" on replacement part(s) costs. as short as possible so it's easier to use. That doesn't mean you can't get the part you need. Email or Call so we can help you decide what part(s) you need. 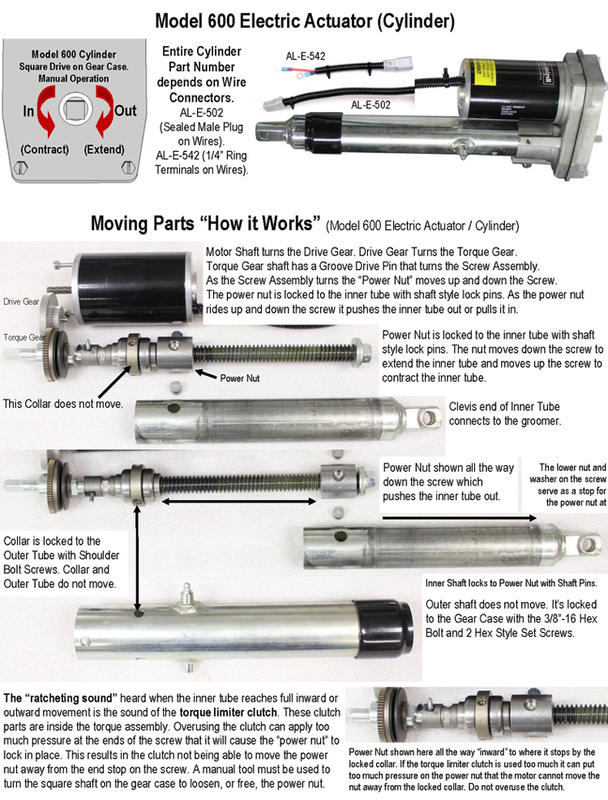 Click on the part number to see a diagram or picture of the part. We stock all parts for all machines. Contact us if you don't see the part you need listed here. Wheel Bearings (2 required per wheel) .625 I.d. x 1.375 o.d. PA-C-101 Chisel Teeth Set. Includes hardware. AL-G-009 Wheel Bearings. 2 needed per wheel. Flanged Bearing 5/8" I.D. (axle) x 1.375 O.D. You may also find these locally at hardware stores. Literature with your original machine includes specs for these wheel bearings. AL-G-008 Wheels (No Air - No Flat). Never need air. Complete with 2 Sealed Bearings (one each side) and Grease Fitting. 5/8" I.D. (axle) x 1.375 O.D. AL-G-017 Aluminum Channels. 6 ft. long. 11 holes. Used to hold poly brushes. AL-G-016 Black Poly Brushes. 6 ft. long. Price discount for qty. of 6 or more. PA-B-101 Broom Frame for Pro Groomer PR72 or All Star AS72 Groomer. 6 ft. long. This is the metal welded frame only. Does not include aluminum channels or brushes. AL-G-033 Brass Flange Bearings (for shaft mounts on HD Model 600 Elec Cylinder Tube). One side bearing is shorter than the other. The short bearing installs on the shaft mount that has the grease fitting. For PR72 and AS72 machines. 6 ft. long. 11 holes. Used for AS72 All Star Groomer. ALDM-1000 Drag Mat Brackets. Set of 2. If you need only one then specify when you order. Includes hardware. For PR72, AS72, WB90, and HY72 Groomers. PA-A-101 Manual Lift Arm. Complete Assembly including Lift Arm, Locking Pin, Spring, and Cotter Pins. For Manual Lift System on Pro Groomer PR72 and All Star Groomer AS72 machines. PA-A-004 Locking Pin for Manual Lift Systems. For Manual Lift System on Pro Groomer PR72 and All Star Groomer AS72 machines. Includes Spring, Washers or Cotter Pins. Attaches to PA-A-001 Lift Arm. AL-G-022 Turnbuckle. PR72 and AS72 Manual Lift System. 5/8" Clevis Ends. 6" Takeup. Galvanized finish. AL-G-508 Spring Tines for PR72 or AS72 Spring Tine Scarifiers. 22 total needed for a complete set. PR72 Leveler Adjustment. Connects to Height Adjustment Screw Lift. PR72 Leveler Adjustment. Connects to Clevis. PRRB-1925 Rock Basket for PR72 Pro Groomer. Fits hole configuration of the PR72 frame only. Bolts to top of frame. Fits hole configuration of the AS72 frame only. Bolts to top of frame. AL-G-007 Spring Tines. Qty. of 22 needed for a full set. Rubber Mat replacement only. Does not include frame. MG-F-102 Center Axle Union - ST Systems. MG Series Machines. WB, BG, GT, DR, HY, and BR machines. This is for the "standard duty ST" style system. Also see HD Style. This brackets uses a 1/4" Clevis Pin to attach to the clevis end of the "ST" Standard Duty Model 225 Elec Cylinder. If your machine uses 1/2" clevis pin to attach the axle union to the cylinder then it's an "HD" system in which case you need MG-F-109. MG-F-109 Center Axle Union - HD Systems. MG Series Machines. WB, BG, GT, DR, HY, and BR machines. This is for the "heavy duty HD" style system. Also see ST Style. This brackets uses a 1/2" Clevis Pin to attach to the clevis end of the "HD" Heavy Duty Model 600 Elec Cylinder. If your machine uses 1/4" clevis pin to attach the axle union to the cylinder then it's an "ST" system in which case you need MG-F-102. For MG Series machines (WB, BG, GT, DR, HY, BR) qty. of two are used for Spring Tine Adjustment front of frame. For PR and AS machines qty. of one is used at front of frame for Spring Tine Adjustment. For MG Series machines (WB, BG, GT, DR, HY, BR) two are used for Rear Wheel Tine Adjustment on each side of rear. to determine which axle you need (left or right). Drag Mat Brackets. For use on all machines. Please confirm the width of your drag mat before ordering. NO 1" x 1" Square Steel Tube. Drag Mat Only. Pairs with Receiver AL-E-549 (433R-6-18). Uses 2032 Coin shaped replacement battery found at many stores. Sticker on back side of Transmitter references part number. It also helps if you provide your machine Serial Number for reference. reference. It also helps if you provide your machine Serial Number for reference. AL-E-006, Wireless Transmitter 433T-2 (Blue Buttons). Pairs to Receiver AL-E-507 (433R-6) . Uses 2032 Coin shaped replacement battery found at many stores. We still have this Transmitter in stock......but not the receiver that it pairs to (AL-E-509, 915R-6). Uses 2032 Coin shaped replacement battery found at many stores. Sticker on back side of Transmitter references part number. AL-E-509 Discontinued Wireless Receiver 915R-6 with Connectors. part number reference. It also helps if you provide your machine Serial Number for reference. AL-E-007, Discontinued Wireless Transmitter 433T-2 (Orange Buttons). Pairs to Receiver AL-E-508 (433R-4, 4 Wire). If you need a replacement Transmitter for this system we can help you update to a current model. Please call. Sticker on back side of Transmitter references part number. It also helps if you provide your machine Serial Number for reference. AL-E-508 Discontinued Wireless Receiver 433R-4 with Connectors. 3/8" Ring Terminals connect to 12V full size battery. Receptacle connects to Wireless Receiver. Male Plug connects to Wireless Receiver. Female Receptacle connects to HD 600 Cylinder Plug. AL-E-505, Battery Charger, G1100 1.1 amp Trickle Charger with 1/4" Ring Terminal Connectors. For "ST" systems. Wiring manual with your original machine includes specs on all wiring system parts. AL-E-506 Battery Charger, G1100 1.1 amp Trickle Charger with 3/8" Ring Terminal Connectors. For "HD" systems. Wiring manual with your original machine includes specs on all wiring system parts. AL-E-543, Battery Charger, Schumacher Brand 1.5 amp Charger with 3/8" Ring Terminal Connectors. For "HD" systems. We have discontinued using this charger. It is still available on the market. Check locally or contact us for specifics. AL-E-503, Battery Monitor. With 1/4" Ring Terminals. Connects to small group U-1 half size sealed deep cycle 12 volt batteries. Be sure to check the size and shape of the connectors at end of wires to confirm you are ordering the correct monitor. 12 volt use only. Wiring manual with your original machine includes specs on all wiring system parts. AL-E-504 Battery Monitor. With 3/8" Ring Terminals. Connects to large group 24 deep cycle 12 volt batteries. AL-E-533, Complete 8 ft. Fused SwitchBox Control, with all wires attached. Complete. plastic switch box. This replaces the entire fused switch box control. Does not include extension wires (10 ft. or 18 ft. extensions). Wiring manual with your original machine includes specs on all wiring system parts. AL-E-537 "SB" 18 Ft. Extension Wire, Sealed Connectors Both Ends. AL-E-538 "SB" 10 Ft. Extension Wire, Sealed Connectors Both Ends. AL-E-551 Lid Only for "SB" SwitchBox. Box cover has rectangular hole for Rocker Switch. AL-E-534, replacement SwitchBox for "SB" Systems. Includes black plastic Box. All holes cut / drilled. Lid and Screws. rubber grommets into new box, then new connectors crimped onto wires to complete the repair. AL-E-512 "HW" 70" long Groomer Tongue Wire (12 ga.) Red and Black Wires. and other end has HD 12V Connector (connects to Tow Machine Wire). Includes Dust Cover. AL-E-513 "HW" 16 ft. long Tow Machine to Switch Control Wire (12 ga.) Red and Black Wires. One end has bare wires (to crimp flat push-on spade style crimp connectors for Rocker Switch). Opposite end has HD 12V Connector that attaches to Groomer Tongue Wire. Includes 2 Crimp on connectors and Dust Cover. AL-E-514 "HW" 8 ft. long Fused Power Wire (12 ga.) Tow Machine Battery to Switch. AL-E-014 "HW" Rubber Dust Cover. Slips over end of HD 12V Connector to keep connector clean from debris. AL-E-069 "CR" 10 ft. long Corded Remote Control. Corded remote only. This does not include the wiring harness. AL-E-544 "CR" 10 ft. Corded Remote and Wiring Harness with Plug and Connectors. The Harness bolts to the front of plastic group 24 battery case of "CR" electric lift systems. 10 ft. Corded Remote plugs into the Harness. Requires wire connections inside battery case to complete the repair. AL-E-068, Contactor (for 12 volt corded remote control systems). AL-E-547 "CR" Fused Power Wire for Corded Remote Elec. Lift Systems (+) Positive Only. 1/4" Ring Terminal connects to Contactor. 3/8" Ring Terminal connects to Positive terminal of Battery. Includes 30 amp slow burn fuse in sealed fuse holder. electric cylinder to 1/4" Ring Terminals for connection to Contactor. For "HD" heavy duty electric lift systems. AL-E-542 Electric Cylinder, HD Model 600 with 1/4" Ring Terminal Connectors. cylinder conversion harness to convert your system to our newest design. For "HD" heavy duty electric lift systems. AL-E-531, Motor Only, Model 600 Electric Cylinder with 1/4" Ring Terminal Connectors. 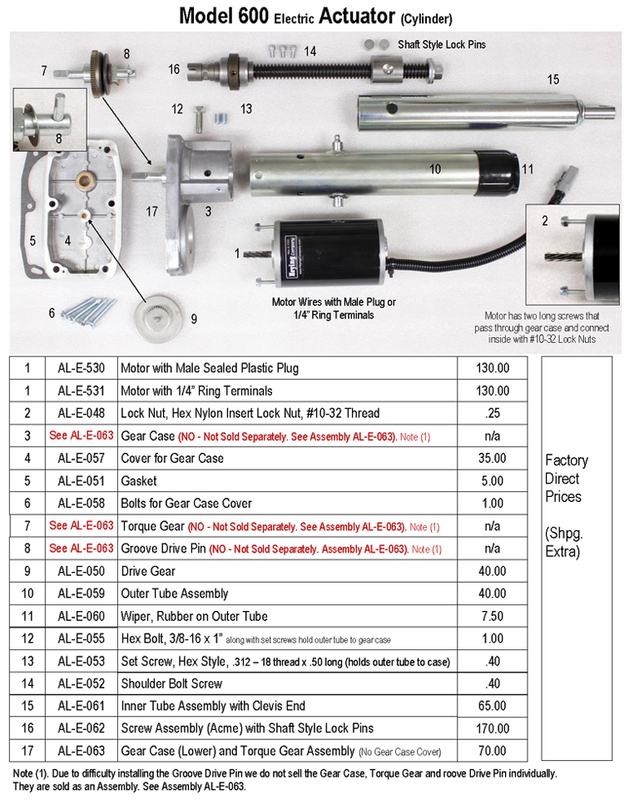 Replacement Parts for AL-E-502 and AL-E-542 (Model 600) HD Actuator / Cylinder. We stock repair parts including motors, gear cases, gaskets, gears, etc. have locking tabs on the lids. AL-E-067 Fuse, 30 Amp Slow Burn (or time delay), Glass Tube Style, 1/4" x 1-1/4". This fuse is NOT a normal 30 amp glass fuse. This is a special slow burn 30 amp fuse (a normal 30 amp glass fuse will blow too easily). AL-E-004, Large Group 24 Deep Cycle 12 volt Marine Battery. For "HD" systems. We do NOT ship this battery. You should purchase a replacement battery locally. Wiring manual with your original machine includes specs on what replacement battery is needed. We recommend taking your old battery along when purchasing a new one to make sure the size matches.....AND to possibly get a credit for a returned core. Contact us for info if needed. For "ST" standard duty electric lift systems. (WB, BG, GT, DR, HY, BR). AL-E-518 ST Extender Harness, 12", 14 ga. Sealed Receptacle and Male Plug. Extends ST 225 cylinder wires into ST size group U1 battery case where it connects to WR Receiver. (WB, BG, GT, DR, HY, BR). AL-E-541 Electric Cylinder, ST Model 225 with Male Bullet Connectors. MG Series machines. cylinder conversion harness to convert your system to our newest design. For "ST" standard duty electric lift systems. 10 Amp Glass Fuse. 1/4" Ring Terminals and 12-14 Female Receptacle. Ring Terminals connect to 18ah 12V Battery. Female Receptacle connects to Wireless Receiver. AL-E-546 "ST" Conversion / Extender Harness 12". For converting old style "ST" Model 225 Electric Cylinders that have bullet fittings to our new style 14-16 Sealed Male Connector. ST Model 225 Elec Cylinders now have a sealed Male Plug on wires. This harness at one end has a 14-16 Female Receptacle that connects to the male plug on new 225 cylinders. Opposite end of harness has bullet fittings to connect to "WR" Wireless Receivers. Case and Lid. Used in "ST" standard duty electric systems. You might also find these locally at hardware or big box stores. Be sure to take your old box along to be sure you get the correct box. Also look for boxes that have locking tabs on the lids. AL-E-003 Sealed 18ah 12 volt Battery. For "ST" systems. Half size battery. We do stock this battery but you might also find locally. recommend taking your old battery along to make sure the size matches and you may get a core return credit. Contact us for info if needed. Site Map - Where Do You Want to Go? Heying Company is dedicated to producing top-of-the-line innovative infield and turf maintenance equipment. With our Infield Groomers you can produce Pro Infields in no time, but you won't need the large grounds crew to get it! Join our satisfied customers across the US, Canada, Latin America and more who are now caring for their infields like an Infield Pro and their turf like a Turf Pro. Our turf customers include golf superintendents, municipalities, High Schools, City Recreation and Parks Departments, Private Baseball and Softball Leagues, Fast pitch Softball, and Colleges who have improved their field conditions, plus they spend less time preparing and maintaining their turf and fields than with other equipment such as the Dirt Doctor, or Infield Rascal. Pull our machines with a variety of towing machines, including 4-Wheelers, Garden Tractors, Gators, ATV's, UTVs and more! Have granular surfaces other than infields, our machines will work on many of them! If you're looking for quality turf and golf maintenance equipment, then our MG72 is the ultimate multi purpose machine. There isn't anything like it on the market for pulverizing aeration cores, grooming golf greens, aerating, de-thatching, leveling top dressings, rejuvenating artificial turf, and much more.